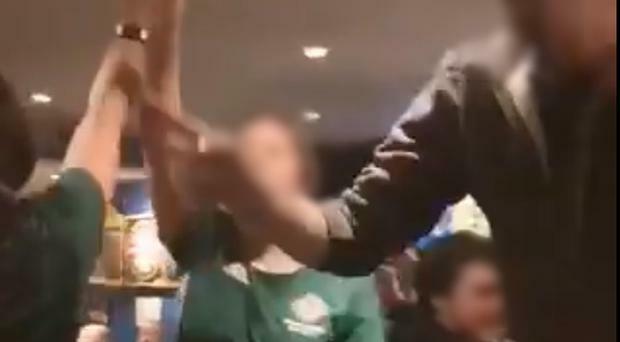 The Irish Football Association has said it will ban the Northern Ireland fans who sang "we hate Catholics" in an online video, if they can be identified. In a further statement on Tuesday the Irish FA said that they would work to ensure the people in the video are prevented from attending Northern Ireland games in future. "The Irish FA condemns sectarianism of any kind. The chanting in the video was wrong and if those involved can be identified, the Association will work to ensure that they are prevented from getting tickets for Northern Ireland matches," a spokesperson said. Alliance Party leader Naomi Long said the video represented "genuinely disgusting conduct" and called for action to be taken against those involved. "I've been to Windsor and watched NI abroad and never witnessed anything like this. No sectarianism, nothing," the East Belfast MLA wrote on Twitter. "Have to say I find this stuff really disgusting." Sinn Fein MLA Sinead Ennis said the IFA must take action against the supporters in the video. “The IFA have rightly condemned the actions of these so-called supporters but they also need to ensure that stringent steps are taken to identify and punish those involved. They should be banned by the IFA and reported to the PSNI," the South Down MLA said. “I have been in contact with the IFA and my party colleague, Councillor Claire Canavan has reported it to the PSNI to stress that there should be zero tolerance to such disgusting displays of hate.